Ναι λοιπόν, απότι φαίνεται θα βγεί σε κανονική σειρά (όχι animation όπως πχ τα dragonlance που βγαίνουν) σε φάση 1 season/book. Θα γαμάει τα πάντα πιθανόν, αφού μεταξύ των άλλων το κάνει το HBO που έχει κάνει carnivale, deadwood, oz κά , που είναι όλα mature/violent και όχι κομμένα και γαμάνε. Είναι γαμώ γιατί δε θα χρειάζεται να διαβάσω και τα βιβλία. Last edited by Kaserinos; 30-03-2011 at 11:28.
άης εντ φάηερ δν ειναι? Re: A Song of Fire and Ice. Auto ofeilw na omologisw oute egw to hksera. gamw!exw diavasei ta 5prwta kai einai kaula.perimenw anubis na mou parei kai ta upoloipa lefta. Now it can be told. VARIETY broke the story yesterday morning, and it's all over the web. I have received hundreds of emails since the announcement went public, many of them asking, "Is it true?" Other readers have posted comments and congratulations in reply to my confirmation on my Live Journal. Yes, it's true. Winter is coming to HBO. Home Box Office has acquired an option on the television and film rights to my fantasy series, A Song of Ice and Fire, in hopes of bringing the story to television as an original, ongoing HBO series. We have been working out the details for months, but the deal is finally done and the pieces are in place, so it's official. I won't rehash the details of the announcement in VARIETY. Go HERE and you can read the story for yourself. The executive producers and showrunners on the project will be David Benioff and D. B. Weiss. Benioff and Weiss will also be writing the pilot script, and -- assuming that HBO eventually greenlights the series -- most of the episodes as well. This will be the first television project for them, but both have experience in novels as well as feature films. David Benioff is the author of the novel The 25th Hour and the collection When the Nines Roll Over: and Other Stories. His screenwriting credits include Troy, Stay, and The 25th Hour, and the forthcoming film versions of Wolverine and The Kite Runner. Dan Weiss has written the novel Lucky Wander Boy and the screen adaptations for the forthcoming films Halo, based on the videogame, and Pattern Recognition, from the William Gibson story. He and Benioff also worked together on the screenplay for Ender's Game, adapting the novel by Orson Scott Card. I met David and Dan in California last fall, when I was out for LACon, and we discussed the show over a long lunch (the restaurant was packed when we arrived, and completely empty when we left, and the waiters had started setting up for dinner). They impressed the hell out of me, and I'm really looking forward to working with them. They're both bright, passionate, enthusiastic. They know the books inside and out, they get the books, and they're committed to bringing my story to your television screens... not a vaguely similar story with the same title (ala Earthsea, or what passed for same on the Sci-Fi Channel). A Song of Ice and Fire should be in very good hands. As for my own involvement, I'll be scripting one episode per season. I'll also serve as co-executive producer on the show, along with Vince Gerardis and Ralph Vicinanza of Created By, and Guymon Casady of Management 360. I have already had a number of emails asking why I am not writing more of the scripts myself. Three big reasons: A Dance With Dragons, The Winds of Winter, A Dream of Spring. As much as I'd like to be a part of the show on a daily basis, as I once was on The Twilight Zone and Beauty and the Beast, the novels take priority. David Benioff and Dan Weiss are very talented writers, but even they can't adapt a book that hasn't been written. I am thrilled to be in business with HBO as well. For years now, the very best drama on television has been found on Sunday nights, in HBO's original series. TV does not get much better than The Sopranos, Six Feet Under, Big Love, Carnivale, The Wire, Deadwood... and my current favorite addiction, Rome. (If you're not watching the second season right now, you're missing the best show on television). Writing, directing, acting, set design, production values... everything on an HBO show is quality, and that's what I have dreamed of for A Song of Ice and Fire. It was only a month or two after A Game of Thrones was first published in 1996 that I received the first query about film and television rights. Nothing ever came of it. Over the years, as the series grew more popular with every subsequent book, I received a steady stream of such queries from producers, directors, screenwriters, studios, and others in the industry. Nothing ever came of them either. Meanwhile, my readers kept asking if A Song of Ice and Fire would ever be filmed. My answer was always the same. While I was always willing to listen to offers, I did not see how the books could be made into a feature film, or even a trilogy of such films, like Lord of the Rings. The novels were simply too big and too complex, and to make the sort of deep cuts that would be necessary to get them down to feature length would have required losing nine-tenths of the characters and three-quarters of the plot. The only way to dramatize a story that size, I felt, was as a television miniseries (like Roots or Shogun) or, better still, a series of series, with each novel providing a full season's worth of episodes. That is precisely what HBO intends to do, starting with A Game of Thrones. With twelve hours to devote to each of the novels, rather than the two to three that a feature film would allow, we should be able to present a faithful dramatization of the story that will please both my own readers, and HBO subscribers who have never read a fantasy novel in their lives. A television series does not spring up full blown overnight, of course. You won't be watching A Game of Thrones on HBO next week, or telling TIVO to record it next month. There's a long and winding road ahead of us, and many pitfalls along the way... but every journey begins with a first step, and who knows? Maybe next year time you'll be seeing Tyrion and Dany and Jon Snow in those HBO promo spots, mixing and mingling with Tony Soprano, Al Swearengen, and Titus Pullo. 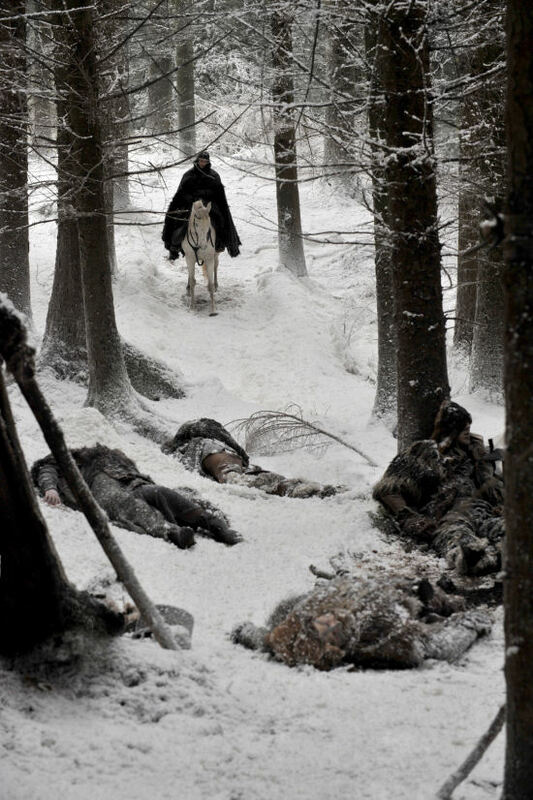 The group joins the previously cast lead Sean Bean as battle-weary Ned Stark, who leaves his home to serve the king. Mark Addy, Kit Harington, Jennifer Ehle, Jack Gleeson, Peter Dinklage and Harry Lloyd also star. Also new to the cast: Richard Madden ("Hope Springs") as Stark's eldest son, Robb; Iain Glen ("Into the Storm") as Ser Jorah Mormont, a disgraced knight; Alfie Allen ("The Other Boleyn Girl") as Theon, Stark's young ward; Sophie Turner, as Stark's eldest daughter, Sansa; Maisie Williams as Stark's young tomboy daughter, Arya. 2 χρόνια μετά, οφείλω να πω ότι ήταν ΤΡΕΛΗ ΜΑΛΑΚΙΑ.